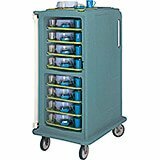 These meal delivery carts hold 14" x 18" trays, 16 tray capacity, 1 door. Safely transport plated meals by the tray from centralized kitchens to acute care patients, nursing home clients or inmates, ensuring optimum food quality within short delivery times. Tough one-piece double-wall polyethylene construction is easy to clean and maintain and won't rust, dent, crack, chip or break. 28" x 36-1/2" x 58-1/8"